All Star Toyota of Baton Rouge is a new and used dealership near Denham Springs, Louisiana that has a fully stocked inventory of vehicles to explore, including the impressive 2018 Toyota Yaris! If you're interested in a nimble, family-friendly ride that offers a range of active safety features and innovative technological advancements, contact our Toyota team to schedule a Yaris test drive! From current lease incentives you can take advantage of to loan assistance and future maintenance services, our Toyota dealership in Baton Rouge, LA is here for you! 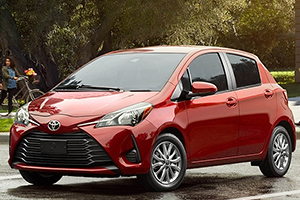 From its aerodynamic design to its flowing lines and curvy silhouette, the 2018 Toyota Yaris is a visually appealing ride that commands attention. Visit our Toyota dealership to see the LED Daytime Running Lights and available 16-inch machined alloy wheels that boast dark accents. 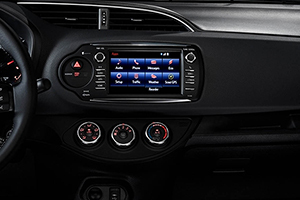 As you move into the Yaris' cabin, the intuitively designed dashboard is sure to inspire you so don't hesitate to get comfortable on the fabric-trimmed seats to take the 2018 Yaris out for a spin. Our team has in-depth knowledge on all the packages that are available to add on so that you can customize your Toyota with ease, so feel free to reach out to us at your earliest convenience! And more! Our friendly Toyota team members look forward to reviewing all the Yaris has to offer. Equipped with a number of active and passive safety systems, the 2018 Toyota Yaris provides drivers with the peace of mind they're searching for. 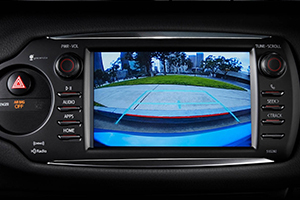 Toyota Safety Sense™ C comes standard with your new 2018 purchase and includes a Pre-Collision System, Lane Departure Alert and Automatic High Beams while the Star Safety System™ boasts a number of braking and traction features that help you stay in control of your Yaris. When you factor in the nine airbags, drivers can agree that the Toyota Yaris is one safe ride. 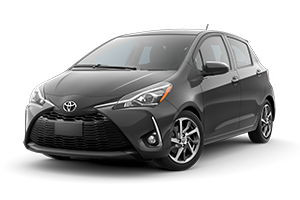 All Star Toyota of Baton Rouge encourages all drivers in the area to shop our competitively priced 2018 Toyota Yaris inventory here at our convenient location or online via our easy-to-navigate site today! We'll not only help you find the trim that complements your needs, but we'll also help you finance it! Ensure you can take your 2018 Yaris home tonight, send our staff a credit application via our website before making your way over from Prairieville, LA to see us!